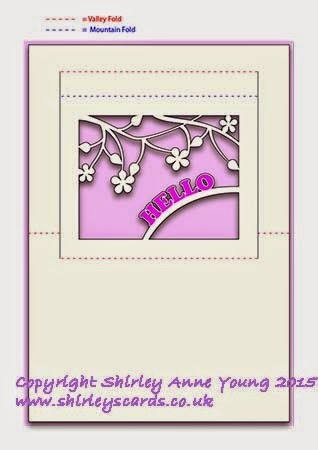 Thought I would do something a little different so today's freebie is a popup card, I do hope you like it. I haven't decorated the front of mine yet but will probably keep it simple, maybe some flowers and a sentiment. The photo below shows how to fold the popup then you just centre it with the outer card and glue together. I find it better just to put glue round the edges of one half of the popup, press the card closed then repeat for the other half. I have also put a few new designs on my website if you'd like to have a look. Wonderful file! Thanks for sharing. That is so pretty! Thank you so much for sharing. I love Popup cards. Thank you. Thank you, I like pop up cards and this one is so cute. Lovely pop-up design! Thanks so much for sharing. Shirley this creation is beautiful. I would like to download some of your SVG files but I cannot get them to download on my computer, mediafire will not cooperate. I still enjoy viewing your files. Thank you. If you want to email me with the details of the files you'd like I'll send them to you Lenoria. très joli pop-up, merci Shirley ! I just found this and think it's great. However, when I click the link nothing happens. Was this a short term freebie? The links are working fine for me. If you are still having problems just email me (address in my profile or on my website) with the format you want and I will send it to you.